Unlike popular solid PVC banners, mesh banners are printed on a perforated banner material. The perforation of the banner allows wind to pass through the material with ease making mesh banners the ideal choice for locations with high wind resistance. 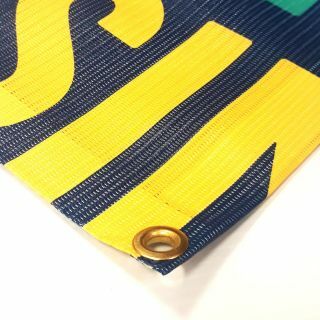 As the Banner material is only 270gsm in weight, this makes the banner material approximately half the weight of normal PVC. Mesh Banners will also appear slightly transparent, this gives them a unique finish if you are looking to advertise but without completely obscuring the view. PVC banners are also commonly known as outdoor or vinyl banners. Outside of board printing, PVC banners are the most popular and cost-effective means of large displays. They are versatile, waterproof, accessible and offer high quality print which makes them an ideal means of large format display, available as a solid PVC or Mesh. Banners are an effective means of advertising or showcasing an event, commonly used for building hoardings and even perfect for personal use. The standard PVC banners are a solid material, whereas the mesh banners are made up with lots of small holes, which means if viewed at a distance it will appear slightly transparent. The other advantage of the Mesh is that it is a lot more wind resistant as they are designed for the wind to pass through.